Bitium is an excellent Single Sign-on provider in an active and valuable space. Many cloud-forward companies have turned to Bitium for enabling access to web applications. Bitium’s catalog of thousands of applications ensures that an organization’s users can use a single login to reach whatever they need. As more companies move to the cloud for their applications, a tool like Bitium’s is incredibly valuable. JumpCloud’s Directory-as-a-Service is also in the Identity-as-a-Service category, but serves a different purpose. 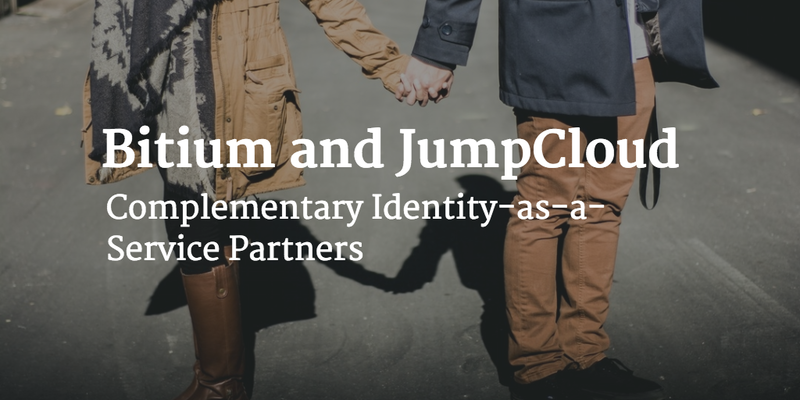 JumpCloud’s platform serves as the core user store for an organization’s identities. Those identities are used to authenticate to a user’s devices, their on-premises applications, and the WiFi network. JumpCloud’s core user directory can be used as the identity source for SSO solutions such as Bitium. And, that’s how we’ve worked closely together with Bitium to create a comprehensive identity and access management solution for organizations. With complementary solutions Bitium and JumpCloud, IT admins can now enable their users to have a single login to just about every IT resource. Here’s how the two work together. JumpCloud and Bitium are connected together such that Bitium can pull user identities from JumpCloud. This integration ensures that the two tools are tied together and in sync. IT admins can now on-board users within JumpCloud and those users are automatically imported into Bitium. That user now has a single set of credentials to access their Windows, Mac, or Linux device. Further, they can access their on-premises applications such as Jira and others. Those same credentials are tied to their AWS, Azure, or Google Compute Engine servers, if needed. Access to the network is provided by JumpCloud’s RADIUS functionality. And, just about every cloud application that the user needs to access is connected via Bitium’s solution. By tying both products together IT now can connect their users to all of their IT resources: devices, applications, and networks. From a user’s perspective they now have one set of credentials for everything. If you would like to learn more about how Bitium and JumpCloud can help your organization, drop us a note. We’d be happy to invite our partners at Bitium to join in the discussion and to help figure out the best implementation strategy for you.